Indulge in a darkly decadent and sinfully sensual world. A world where vampires are real, rich and hungry, a world where Blood Courtesans satisfy all their needs. Come, let fangs slip into your throat and awaken you to a whole new life. 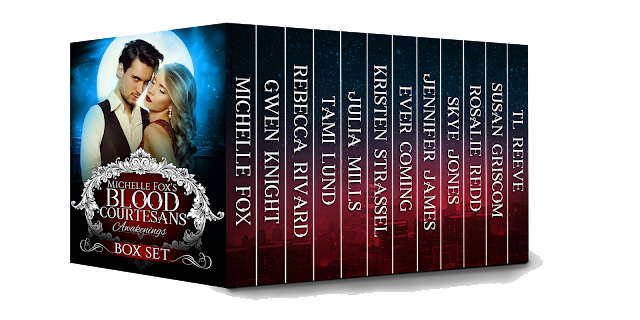 A boxed set of BRAND NEW stories in this popular series. Warning: This isn't your momma's vampire romance. It's not Twilight or the Shade, either. 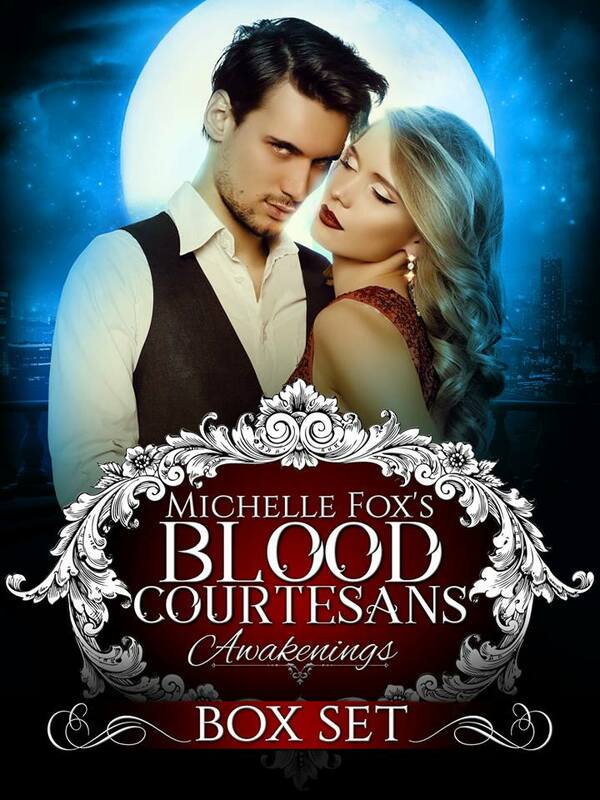 It's Blood Courtesans: Luxury, fast cars, adventure, whirlwind romance and cold, hard fangs. "So you wanted to be a Blood Courtesan. You thought that would get you what you wanted?" He leaned down, looming over me. "Well, through your own stupidity, you're going to find out if that was a good plan or not." "I am?" My voice came out in a breathy dog whistle squeak. "I will take you as mine." "You will?" This was a whisper, my vocal cords had drawn tight, strangled by fight-or-flight adrenaline. "In every way." Pyro's eyes held a knowing gleam I didn't understand, and the baritone rumble of his voice throbbed with wickedness. My body responded with a throb of its own, like a nearby tribe answering a signal. His voice, just his voice had slipped through my skin cells to the vulnerable flesh beneath. That was all it took for him to get to me. "This way Theo cannot touch you and I am repaid for the trouble you have caused." He rested a finger on my cheek and slipped it down to my jaw and then lower, to the hollow of my neck. My pulse tapped out an SOS into his finger, but he didn't notice...or maybe he didn't care. "Fortunately for you, I am between courtesans right now." "That's me. So lucky," I half-sobbed. I wanted to be brave, but I had no way out and I knew it. Pyro's offer or death. Those were my choices. No in between. "No tears, Violet. You brought this on yourself." He gripped my chin and his hard gaze drilled into mine. "But you're pretty. You have a nice blush. And if I'm any judge of women, you're innocent, yes?" I didn't respond and he gave me a little shake. "Answer me. You're untouched, aren't you?" "Yes." And when he bit me, he'd know why. "A crazy little virgin in my bed." He let me go and stepped back, shaking his head. "I would have never thought to ask for someone like you, but now that you're here..." He trailed off. "What?" The question tumbled from nerveless lips. "I'm going to enjoy making you scream."